There were explosions, color changing liquids and plumes of fire at the Vienna Nursing and Rehabilitation Center on Sunday. 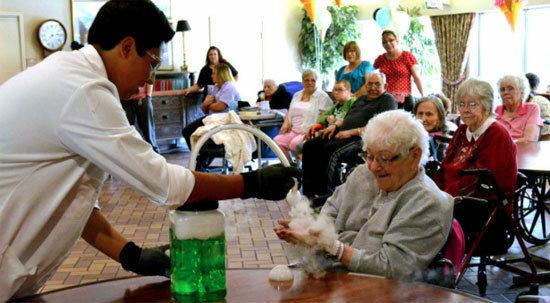 WOW Museum Assistan Luis Anaya creates a bubble of carbon dioxide to drop into Judy Martinez's hands at Vienna Nursing and Rehabilitation Center. Jen Young, WOW Museum education coordinator gets children volunteers from the audience to stand at attention before the next experiment.